This manuscript compilation contains a number of tables, diagrams, and shorthand annotations. 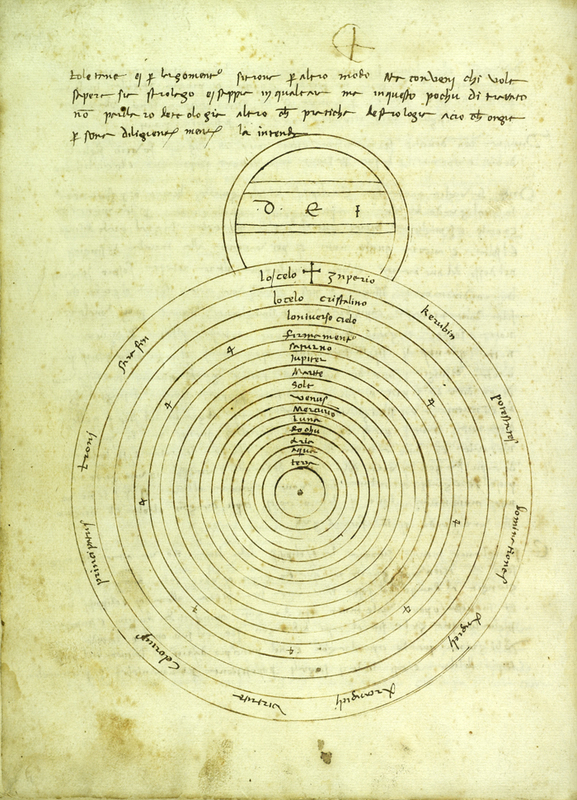 Among the astronomical and astrological topics addressed are: calendars, lunar phases, computations of hours, a Horoscope, planetary accounts; and diagram of the universe (shown). The diagram exhibited from this manuscript illustrates a geocentric understanding of the universe: the earth is at the center with the other three elements water, air and fire above it. These constitute what the 13th-century astronomer Sacrobosco, called the elementary region of the universe. Above this is the ethereal region, consisting of the seven known planets- the Moon, Mercury, Venus, the Sun, Mars, Jupiter, and Saturn. Above this lies the firmament, which contains the fixed stars, and beyond that the ninth heaven. To this cosmology, the author has added the crystalline heaven and beyond that the Emperion, the dwelling place of the angels. Within the Emperion, he lists the celestial hierarchy of angels, reading, in clockwise position- Cherubim, Powers, Dominations, Angels, Archangels, Virtutes, Celorius, Principalities, Thrones, and Seraphim. Nine of these orders are common enough, though Hirsch failed to identify Celorius (as noted, perhaps a corruption of an abbreviation for celestial carried over from the exemplar as a tenth order?) among any of the more common additions to the hierarchy. Finally, in an attached but altogether separate three-quarter circle, he shows DEI. Acquired by Lehigh in 1963, from the gift to the Library of Mr. Watson Over.